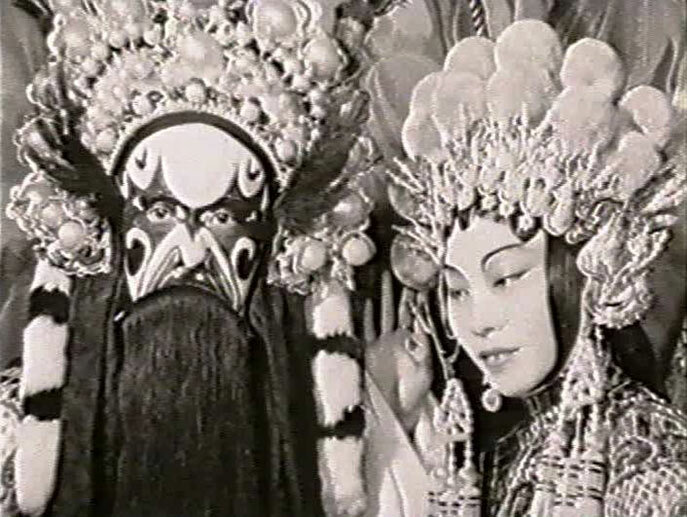 This unusual footage shows a Chinese opera performance at a theatre in Vancouver’s Chinatown. It was filmed from the audience seats (in at least three different camera positions) on February 8, 1944. The footage was shot by Vancouver filmmaker and cinephile Oscar Burritt. 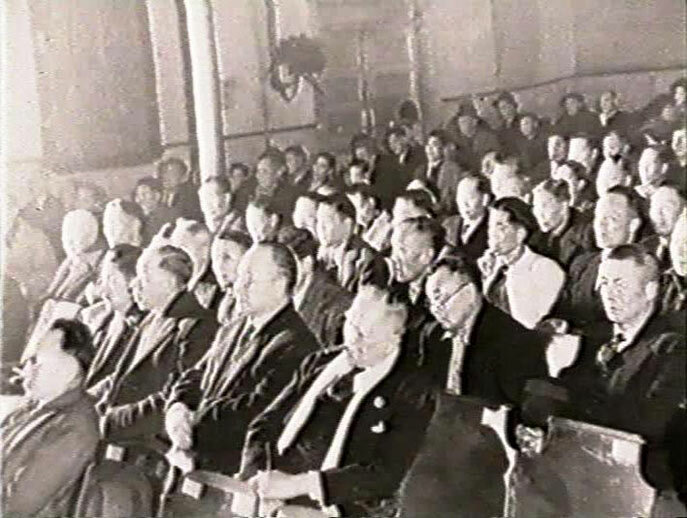 In these edited excerpts, the first section (0:10 – 1:31) appears to have been filmed from the front row of the theatre. The major characters are recorded, along with some telling facial expressions — but the lens is almost too close to the action. The actors often crowd the edge of the frame, and when they work downstage, they tower over the camera. Because of the low light levels, the lens’s depth of field is extremely shallow, resulting in some rather soft-focused shots. Burritt changes position, taking a single, too-brief shot from the balcony seats (1:32 – 1:35). He then moves to the right side of the auditorium, where he has a better angle on the action. 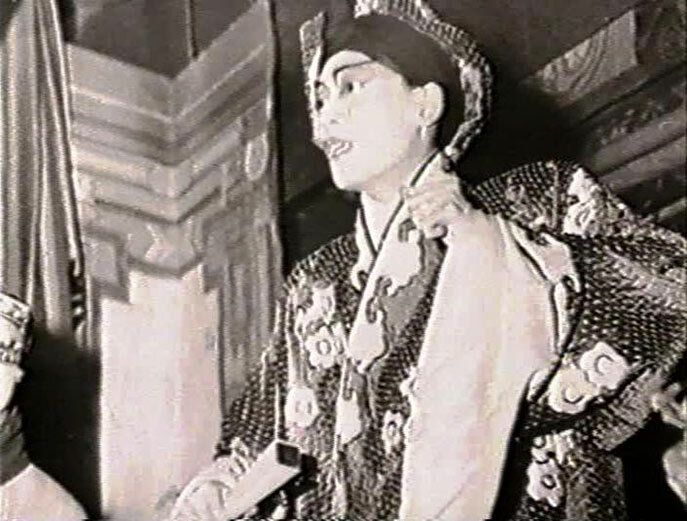 The film ends abruptly as two of the actresses seem to step out for their curtain call (2:14). The onstage orchestra is seen briefly (at 0:53 and 1:50), and there are a few glimpses of people looking on from backstage (at 0:40 and 1:41). One of the things in this film which you will find unique, because it doesn’t seem to exist anymore: when the sailor escapes from the courtroom and runs away, he runs into San Francisco’s Chinatown – which is, like that of Vancouver, gradually receding into the past. And so the sailor hides in the theatre, and you see the performance on the stage. Now, this was of particular interest to me because, when I grew up in Vancouver, we had three theatres in the Cantonese tongue. 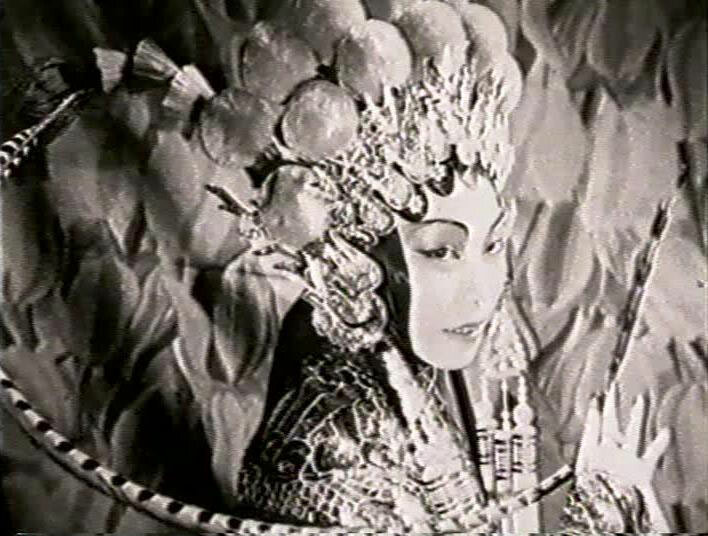 I have here a few pictures which you might like to see, of some of the great stars of the past of the Chinese opera. . . .
*Note: These comments, like the above images (which show still photographs taken by Mr. Burritt) are from our video copy of the film clip [Oscar C. Burritt introduces The Lady from Shanghai] (CBC, 1969), V1990:06/001.02 item #2, description AAAA2510. 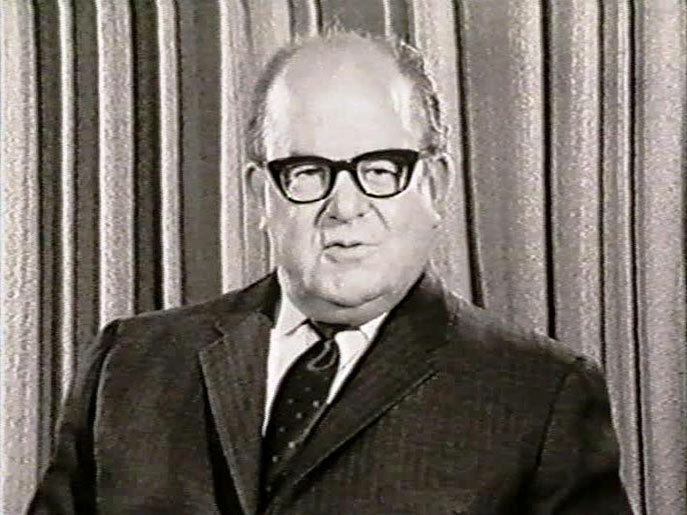 Oscar Chamberlin Burritt (1908-1974) began making creative and interesting amateur movies in the late 1930s, often collaborating with his wife, Dorothy (Fowler) Burritt (1910-1963). Keen enthusiasts for the art of cinema, the Burritts were very active in the Vancouver Film Society, which brought foreign and “art” films to local audiences. By 1943, Oscar was steadily employed as a cinematographer for Vancouver Motion Pictures Limited, one of the city’s pioneering production companies. Before long he was directing industrial films like The Herring Hunters (1945), as well as shooting and directing the documentary shorts that VMP produced under contract for the National Film Board. (For example: Tomorrow’s Timber, 1944; Salmon Run, 1945; Of Japanese Descent, 1945.) In 1947, Dorothy and Oscar moved to Toronto, where Oscar initially worked for Shelly Films before joining the staff of CBC Toronto in 1950. The Burritts were also active in the Toronto Film Society, and Dorothy helped to found the Canadian Federation of Film Societies. At the Canadian Film Awards in 1963, they shared a special award for their “pioneering work over three decades” in promoting film appreciation in Canada. The BC Archives holds other films and footage by Oscar and Dorothy Burritt. It’s worth noting that the Burritt films listed in the online index are found in five different collections or fonds at the BC Archives. The Oscar and Dorothy Burritt fonds (PR-1780) comprises thirteen reels of original 16 mm film, received in 1986 from the Burritt family of Vancouver. The Douglas S. Wilson collection (PR-2232) contains videotape copies of seven other films, acquired through the cooperation of a Burritt friend and film collector in Toronto. It also includes a duplicate print of Suite Two: A Memo to Oscar, a 1947 film by Dorothy Burritt and Stanley Fox — as well a photo of the portrait that Dorothy is shown sitting for in that film. This material was acquired between 1985 and 1990. The Stanley Fox fonds (PR-2239) includes the 16 mm film original of Suite Two, which was acquired and restored by the BC Archives in 1986. The British Columbia Packers Limited fonds (PR-1777), acquired in 1985, includes release prints of three films that Oscar Burritt directed or photographed at Vancouver Motion Pictures – two for B.C. Packers, and one for the National Film Board. Finally, the Pacific Cinematheque collection (PR-2235) contains release prints of two of Oscar’s NFB productions, acquired in 1987 and 1989. The above is an excellent illustration of how records relating to an individual (or a couple) can end up dispersed into many different hands. By bringing together these five groups of records at the BC Archives, we’ve enabled future researchers to get a broader picture of the Burritts and their place in Canadian film history. Dennis wrote/edited three books in the archives' Sound Heritage Series, and produced three of the documentary sound programs that accompanied the series. In 1982-1986, he was principal researcher for the B.C. Filmography Project, compiling data about films produced in the province. His publications include Imagine Please: Early Radio Broadcasting in British Columbia, Camera West: British Columbia on Film, 1941-1965, and the RBCM DVD Evergreen Playland.